Here’s our Top Picks for the Weekend of September 22nd & 23rd! Fall is here, and so are u-pick apples, pears, concord grapes in Apple Hill! There are so many special storytimes this weekend that are only hosted once a month, like at Underground Books and Effie Yeaw… anyone for hip hop storytime? Tour and ride a B-17 bomber, eat pancakes in the park, and get hypnotized in a family-friendly comedy show. The pop-up adventure play day with Fairytale Town in South Natomas looks fantastic. Celebrate deaf awareness at the zoo. We also have Latino and Greek food festivals. Get in free at the California Museum. Celebrate the Autumn Equinox! Learn all about galls on a nature walk, and then learn how to plant a tree in a 2-hour workshop for $8. Have a great weekend. Mostly sunny, highs of 91/89 forecasted for Sat. & Sun. Enjoy the gorgeous weather! Children’s Clothing and Equipment Sale, hosted by Parents of Multiples Sacramento at Faith Lutheran Church. Find amazing deals on gently used clothing for babies and children of all ages, maternity wear, equipment, toys, books, and so much more! The sale is from 9:00AM to 1:00PM. Red-tag items are half price starting at noon. It is free to shop and sell at this event. Members and non-members can sell gently used baby/child and maternity Items. Contact Kendra Martinez at pomspresident@gmail.com if interested in selling. Free, cost of purchases. Sat. 9am – 1pm. Faith Lutheran Church, 4000 San Juan Ave., Fair Oaks. Take teens to learn about their genealogy at Book a Genealogist. Central Library’s amazing volunteer genealogists are available to assist you with a free, 45-minute session in the Genealogy Center on the 2nd Floor. Appointments are offered on Sundays at 1:00, 2:00, and 3:00 pm. To make an appointment, register online, call the library at 916-264-2920, or visit a Sacramento Public Library branch in person. Sessions book up fast, so you might need to reserve a spot for next week. Around sunset (Sat, 7pm), the sun crosses the celestial equator and makes its journey southward, marking the Autumnal Equinox and the start of fall! Have a fall harvest party and break out the pumpkin pie! Take a break from the school week, and walk somewhere with a clearing so you can see the Full Harvest Moon on Monday, around 8pm. This is the full moon closest to the autumnal equinox, and it usually rises at least 50 minutes later than usual. Calling all Rubik’s cube-lovin’ moms and dads… anyone interested in teaching a Rubik’s solving workshop (in small groups) with Sactown Kids next year for kids? Know anyone who grew up in the 80s? We’re thinking about hosting free science and nature events in the great outdoors in 2019. 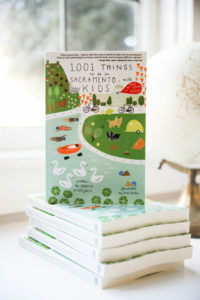 Contact us at hello@sactownkids.com if you have a specialty you would be willing to share with local kids for free!